Designers are turning more and more to what is generally considered waste to make sustainable materials. According to an article on Materialdistrict.com one such a waste product are potato peels. To make 1 kilogram of fries, you need two kilograms of potatoes. In part, this due to loss of water during the baking process, but also because fries without a peel generally preferred. And that is only one dish made from potatoes. peels are spread into a circular mould. The resulting sheet is rolled into a cone-shape. The packaging does not need any additional ingredients, like gelatine or latex, to gain its solidity. After use, the material is 100 per cent biodegradable. 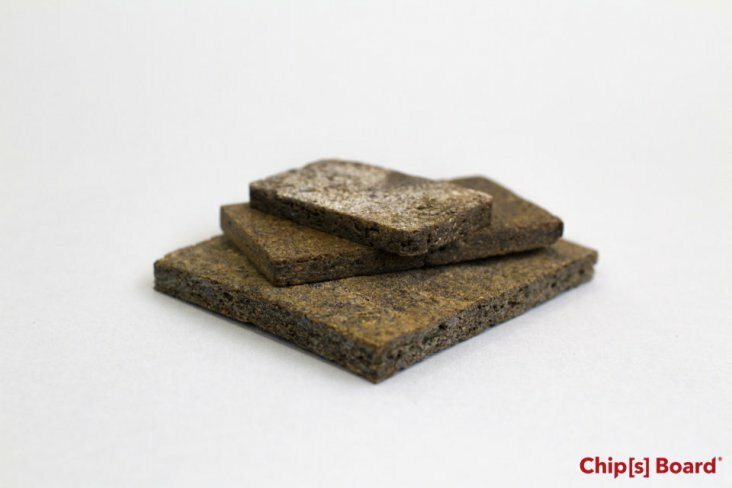 The company Chip[s] Board developed two types of board material made from potato waste. The chip particle boards is a fine grain rigid board, available in a variety of colours. The chip stand board is a smooth fibreboard with a good tensile strength. The company also offers Parblex, a translucent durable bioplastic for fashion and interior design. None of the materials contain toxic resins of chemicals derived from oil. Early tests have shown that the material is biodegradable, but the company is still working to get this confirm to apply for a Cradle-2-Cradle certification.